Some time ago I had the opportunity of getting a tour at Game Science Center in Berlin. The permanent exhibition focuses on the future of gaming and interactions and features a number of really cool things. The whole exhibition is interactive and none of the exhibits really needed any instructions! 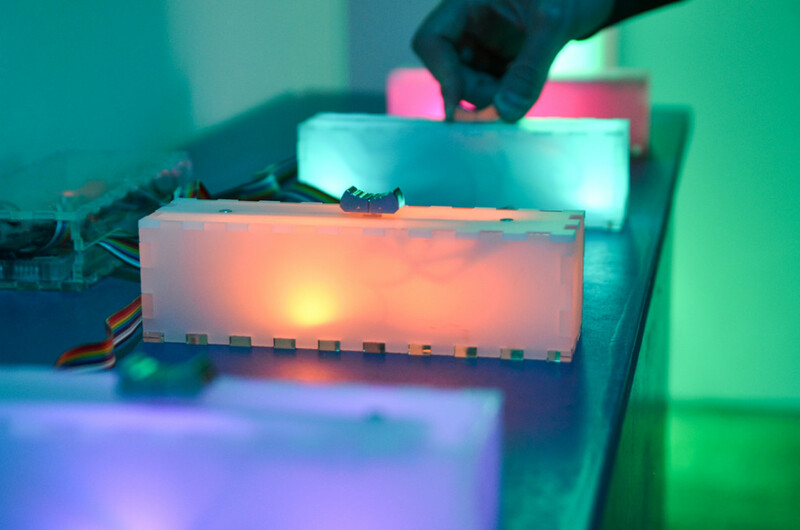 There were no keyboards, mice or typical game controllers as the exhibition focuses on the new wave of interactive devices. My #1 favourite thing in the exhibition was the augmented reality sandbox. 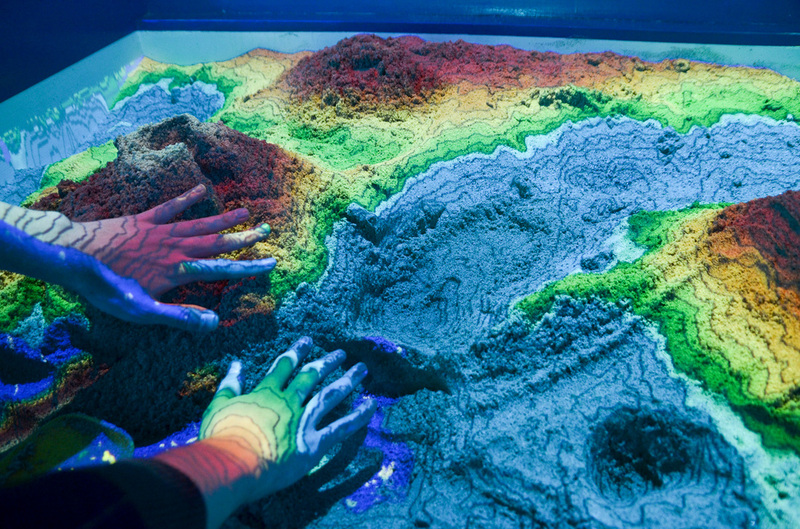 It was basically a sandbox that had a Kinect 3D above it, calculating the heights and shapes of the sand, and a projector projecting real-time topographic map on the sand surface. It was the first thing we saw at the exhibition and we basically had to be dragged away from it. So much fun and needed no instructions! You can get a pretty good picture of the interaction from this very popular video on Youtube. The exhibition featured a number of devices and toys that an average consumer would rarely buy to their homes, including Leap Motion, Oculus Rift and Choosatron. Even though I had tried them all out before, it was great to see what people had come up with in these demos. It was also my first time getting to try eye tracking in games. As I’m focused mostly on mobile games, I didn’t really consider the other demos from a professional perspective, but I can really see eye-tracking playing a major part in the future of mobile devices. 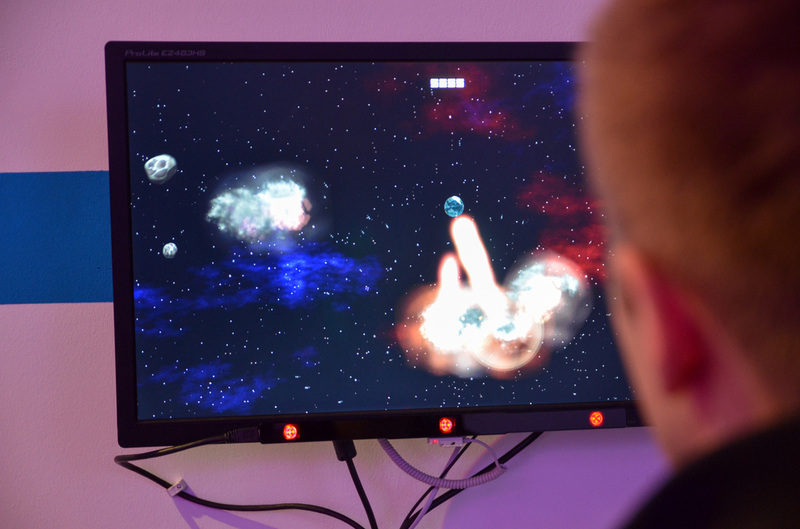 The game we got to test was a simple asteroids game where you were playing as the Earth and you were avoiding asteroids by .. looking at them. It was the strangest feeling when the main game objective was just to look at objects and they would explode under your evil eye. Definitely an eye-catching experience! 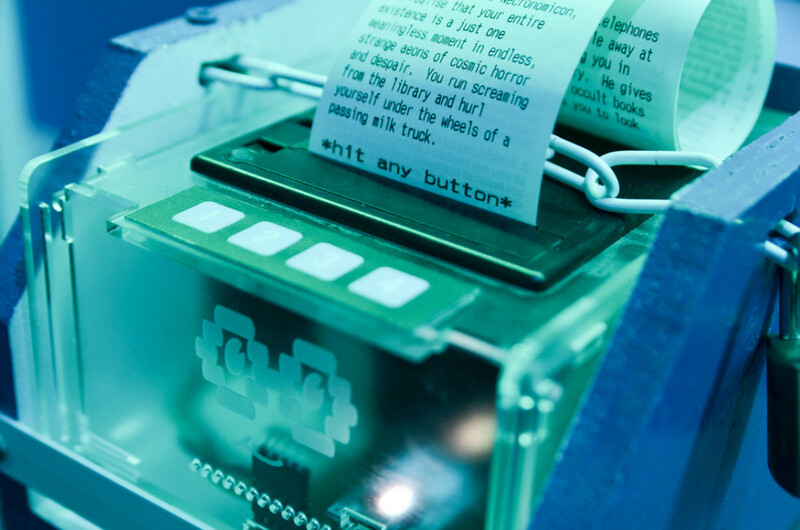 Choosatron – I didn’t make it. Overall we had a great time at the exhibition and it was really great to get to try out all these toys we can’t afford to buy. I can really recommend the exhibition to all Berliners and people visiting Berlin. Couple of weeks ago I attended a IGDA game jam in Tallinn and met a great number of both Estonian and international developers as well as participated in several interesting seminars about game business in general. As I had to travel there only for the weekend, I didn’t want to stress too much about working on a game and mostly focused on meeting new people and enjoying the whole experience. One of the seminars was held second year in a row by a representative from cashplay.co about mobile game monetisation. The big change from last year’s presentation was the fact that Apple had also finally accepted cash tournaments in their apps somewhere along the last year so I had a whole new level of interest in the topic and I wanted to share my learnings in the blog. So how do cash tournaments work in mobile games? The basic idea of cash tournaments is that it adds an online multiplayer layer to your games. Players will be joining tournaments and be paired/grouped against random opponents and play for free or for real money. The game developer itself gets a small rake percentage, very much like in online poker tournaments. Once players register to cashplay.co they get a free $3 as a signing bonus. The lowest buy-ins I saw were $0.10 so this already gives plenty to play for. Most of the tournaments I found were 1vs1 tournaments, where the rake percentage is 10% (2 players pay $0.11, winner gets $0.20). The developer gets 60% rev-share from the profits which is extremely generous compared to other monetisation models. During the event Cashplay organised a big tournament for all the participants playing Nitro Nation Drag Racing. After the hassle with registrations and people learning how to play the game, it became extremely hectic! People started cheering and yelling as the results page was updated automatically on the big screen. Overall it was a really fun experience! One important thing about cash tournaments is that the games pretty much have to be skill-based games. The game experience has to be exactly the same for both players or it will be labeled as gambling. This doesn’t mean that you can’t have a random factor in your games though, as long as it is the same for all players involved. For example you can have a random generated endless runner game as long as the enemies and obstacles are appearing in the same order at the same time. Unlike pretty much any other monetisation model – cash play tournaments actually add something to your game experience. It can turn a simple single player game into a multiplayer online game. What kind of games does it work with? As I mentioned before, cash play tournaments mostly work with skill based games. It can add a great new layer to a point scoring game if the players are suddenly competing for real money. Any games I know of? Out of the more famous games, Nitro Nation Drag Racing by Creative Mobile and apparently also Timberman by Digital Melody will be featuring Cashplay. You can find more games using Cashplay from their website. I think cash tournaments is a very interesting concept for mobile game monetisation and I wil seriously consider it for my future games. I’ve been a fairly serious chess player throughout my life and I used to compete in international level when I was younger. I’ve had a few game ideas related to chess and Knight Squares is the first one that came to life. The idea to Knight Squares came from the mathematical problem called Knight’s Tour. Knight Tour is a tour a knight takes to visit each square of a chess board once, and only once. There are several mathematical articles on the subject but I won’t go too into much detail on those. I wanted to make a simple game based on the movement of knights. I implemented a 5×5 chess board which seemed to be the perfect size for the iPhone screen and also provides a total of 1728 different knight’s tour variations. My original idea for a game was to make the player move around the board, collecting objects and avoiding illegal squares that moved around randomly. How the game worked was that the white circles were collectables and the red crosses were unavailable squares. The red bar at the top was health bar, that was diminished if you didn’t collect the white circles in time or if you accidentally collected a red one. You can see the faint progress bar inside the circles. Now this game wasn’t too bad, but I quickly realised it was WAY too complicated for unexperienced chess players. I even had a 9-part tutorial explaining how the knight moves and all, but people failed to understand the game and it was not fun at all. Just when they were about to reach a white circle, the timer ran out and it disappeared. Due to life(tm) and lack of resources at the time, I decided to leave this game to a prototype phase to wait for better times. Until very recently, about 4 months after finishing the initial prototype, I started talking with a 2D vector artist on #indieteamup (@octrion on Twitter, check him out!) who was looking for new projects for his portfolio. I was going through my prototypes and realised that Knight Squares could look really cool with minimalistic vector graphics. I told him about the idea and already the next day I had all new assets for the game. 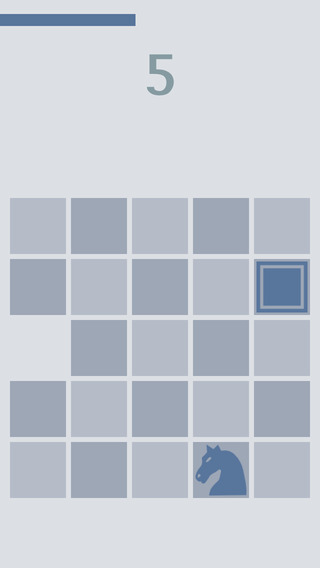 I also realised I’d have to make the game way simpler, so I made the game only have one target at a time that doesn’t disappear until you collect it, and to have unavailable squares that change their location randomly. In addition to this, there is no health bar anymore but a simple 30-second timer which marks the length of the game. Collecting targets gives players a second of extra time. I really like the outcome of the game and I think it offers a cool challenge for experienced chess players but also teaches beginning chess players to think a couple moves ahead. 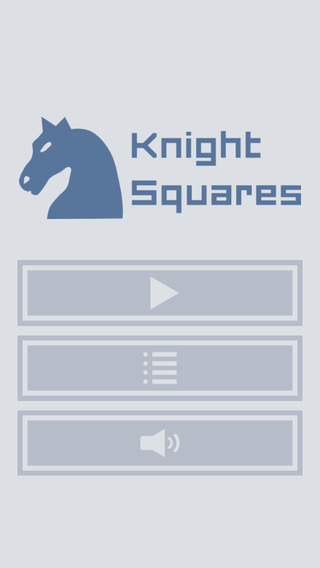 Knight Squares will be available on AppStore for free!